Uglyworld #638 - Best Use For An Active Imagination, originally uploaded by www.bazpics.com. After Babo told Wedgehead earlier, "I needs some minutes to mentally prepares myself, I will be backs soon!" Wedgie stood slamming ball after ball into the net with ever increasing force in anticipation of Babo's return to the net. As Babo walked back towards the net she didn't even glance for a split second in the direction of Wedgie, she was 110% focused on the job she had to do. Wedgehead took 3 shots in rapid fire, the first whizzed into the back of the net, the second Babo got her fingertips to, and the third - well you can see for yourself - a magnificent diving save by Babo kept the ball out of the net much to the frustration of Wedgehead. 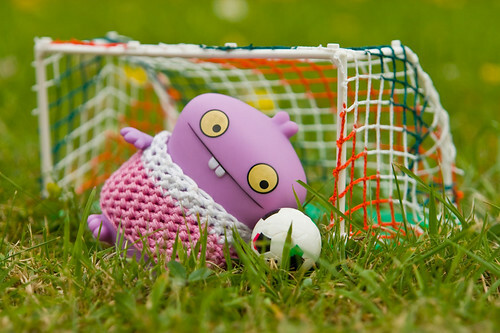 I asked Babo how she managed to improve so quickly to which she replied, "I calls up my friend Manuel Neuer in South Africa for some tips, and he tells me that he practices by thinking the balls is Nutella, and he suggested I imagines they is cookies, it works too!!!". Babo said that she wished Manuel the best of luck for tonight and that if he can help Germany win she'll share some super-duper-choco-chipo cookies with him and the other players. Babo's prediction is 2-1 to Germany, when I asked why she thought Spain would score a goal she said, "Spain will gets a lucky goal as Manuel gets distracteds by a fan eatings a roll with Nutella ons it". Only time will tell I suppose! Ah, the wonders of a great mind!